backwards, turn, rotate its head, make sounds, and flash its eyes. 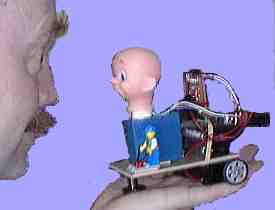 electronics are not used), and a third servo to rotate the head. It took maybe a weekend to build, but I'm still playing with the design.